Bags to ship sugar to be woven of lauhala or akaakai? 1873. Here is something that is much sought after by the producers of sugar. Bags that are woven with strips [ko-ana] of bulrush [akaakai] or lauahala perhaps, to put brown sugar [ko-paa eleele] in and ship to Australia or America. The previous week, a schooner brought 15,000 bags of this type from New Zealand, and the haole traders greatly appreciated them. The length of the bags are 33 inches, and 17 inches wide. If bags like these are woven here at a reasonable price, and a thousand are made, they will be sold out in a year. Bags of this type are desired, not bags made with wide strips, but finer ones; not strips wider than a quarter inch. We have with us a bag of this type, and for those who want to weave bags, they should come first to see, because perhaps this kind of bag can be made here. The haole won’t buy them if your work is bad, but for good bags, they will pay ten dollars ($10.00) for a hundred; that is 10 cents for one bag. If they are very sturdy, they may increase it $12.00 per thousand. Nobody should start weaving without seeing first the bag that we have, as a sample to make like. 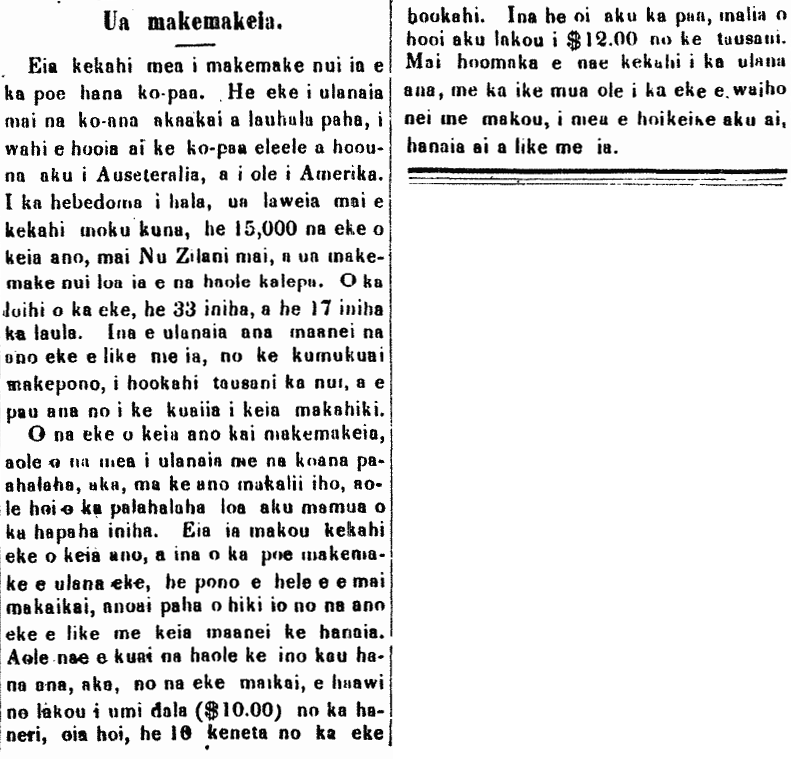 This entry was posted in Advertisement / Announcement, Commerce, Farming, Foreign Plants, New Zealand/Maori, Self-sufficiency, Sugar, Traditional Plants, Weaving and tagged akaakai, bulrush, lau hala, lauhala by nupepa. Bookmark the permalink.